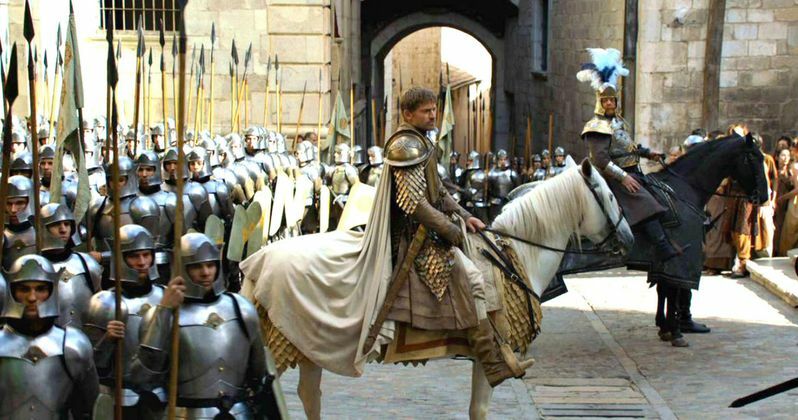 The magical land of Westeros in HBO's Game of Thrones is one that is often consumed by war. And the mysterious Season 6 will be no different. While there will certainly be a number of battles that take place throughout Westeros, the most important may be in the North, as teased by Liam Cunningham's Davos Seaworth in a new trailer released by HBO earlier today. This character claims that a war between the living and the dead is coming. This footage gives us another look at the powerful Night's King, who we first saw in the Season 5 episode Hardhome. While we don't know for sure, it seems possible that the Night's King could lead his army of undead soldiers to Castle Black, where the Night's Watch will have to stop them from entering Westeros. The trailer also features Jamie Lannister (Nikolaj Coster-Waldau) confronting the High Sparrow (Jonathan Pryce), telling this religious leader that he isn't afraid to spill blood in a holy place. We also see cryptic footage of Daenerys' (Emilia Clarke) dragon Drogon flying over the desert, possibly in an attempt to rescue Dany. When we last saw Dany and Drogon in the Season 5 finale, it was clear that Drogon wasn't well enough to fly, and shortly thereafter, Dany was captured by a horde of Dothraki soldiers. We also see Dany being stripped naked by these Dothraki savages, although it isn't clear what they intend to do with her. This latest footage also shows Arya Stark (Maisie Williams) at the House of Black and White, where she has been blinded by her mentor Jaquen H'gar (Tom Wlaschiha), and warned that she will get a second chance, but not a third. We also get new looks at Sansa Stark (Sophie Turner) and Petyr Baelish (Aidan Gillen). There's even a glimpse at a few returning characters we haven't seen in quite some time. This trailer offers a new look at Yara Greyjoy (Gemma Whelan), Theon's sister, and Bran Stark (Isaac Hempstead-Wright), both of which haven't been seen since Season 4. A rumor from the set surfaced in September, claiming the actress was spotted alongside new cast member Pilou Asbæk, who is said to be playing Theon and Yara's uncle, Euron Greyjoy. As for Bran, his story had already caught up with the books at the end of Season 4, so he sat out last season. But now we'll get to see him put his greensight to use, after training with the Three-Eyed Raven (Max von Sydow). The trailer ends with Tyrion Lannister (Peter Dinklage) telling Varys (Conleth Hill) and Missandei (Nathalie Emmanuel) that dragons don't do well in captivity. As you'll recall, last season, Dany put her two dragons in cages, before the then-missing third dragon, Drogon, returned to save her after an assassination attempt by the Sons of the Harpy. It seems that the other two dragons could be set free, but we'll have to wait and see if they'll try to help save their "mother" or not. While we wait for more details, check out the latest footage from Season 6 of Game of Thrones, debuting Sunday, April 24 at 9 PM ET on HBO.